Gloriæ Dei Cantores Schola presents The Chants of Angels. Using the ancient melodies and texts of the early church, each Gregorian chant depicts a new aspect or story of these heavenly guardians, guides and friends, from the most intimate plea to our own guardian angels, to the great announcement made to the Virgin Mary by the Archangel Gabriel. 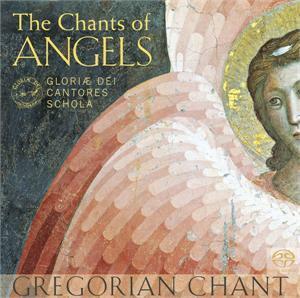 For those who are new to Gregorian chant and for seasoned scholars, The Chants of Angels allows listeners to simply close their eyes, and be surrounded by these songs of prayer and comfort -- just as they are surrounded by angels. "I've been writing about the angels for many years. When I listen to The Chants of Angels, I feel as if I'm that much closer to my heavenly subject matter. This music is glorious, and I mean that in the most technical theological sense. Thank you."